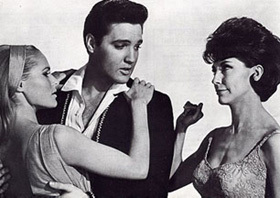 Elvis In The Film,"Fun in Acapulco". a scene from thr film fun in acapulco. Wallpaper and background images in the Elvis Presley club tagged: elvis film music performance image photo. This Elvis Presley photo might contain porträt, kopfbild, nahaufnahme, portrait, headshot, and kopfschuss.